Source: Greenwich Press. 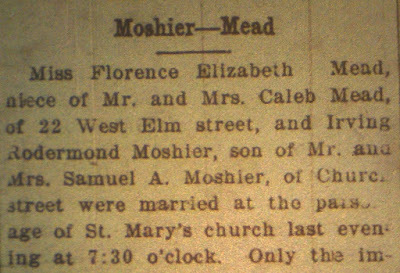 February 11, 1913. 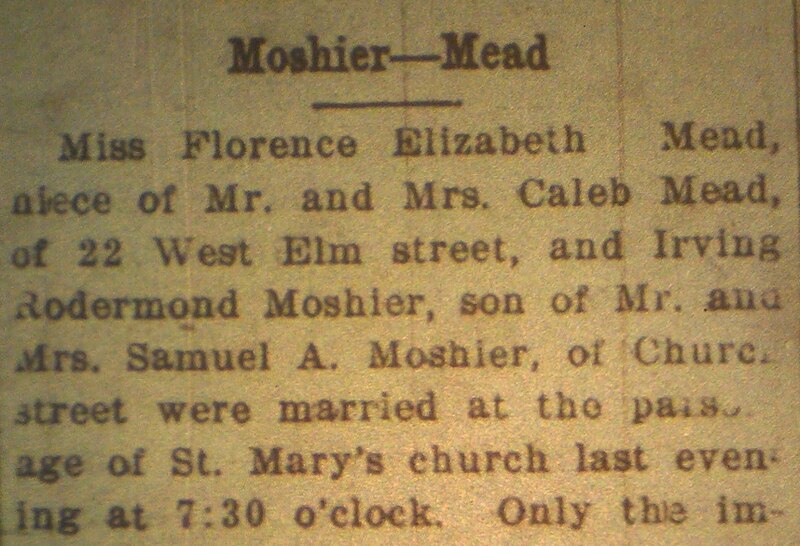 Miss Florence Elizabeth Mead, niece of Mr. and Mrs. Caleb and Mead, of 22 W. Elm St., and Irving Rodermond Moshier, son of Mr. and Mrs. Samuel A. Moshier, of Church Street were married at the parsonage of St. Mary's Church last evening at 7:30 o'clock. Only the immediate families of the contracting parties attended the ceremony. The ceremony was performed [by] the Rev. M. J. Ryan, the curate [of] the church. The bride was gowned in a green satin broadcloth suit, with picture had trimmed with green tulle. She carried the shower bouquet of large white roses and lillies of the valley. 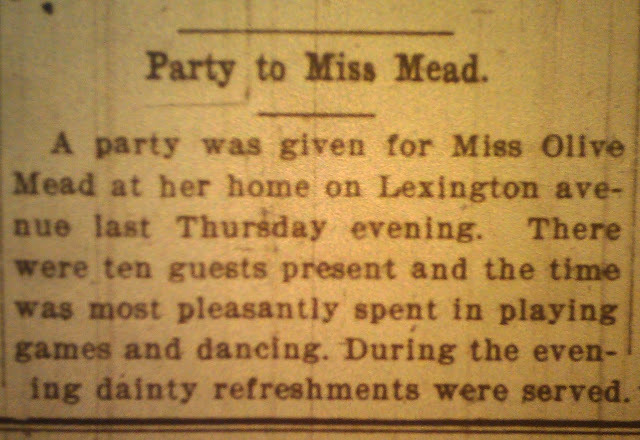 Miss Helen Mead, a sister of the bride, as bridesmaid, wore a gray broadcloth suit, with hat to match. 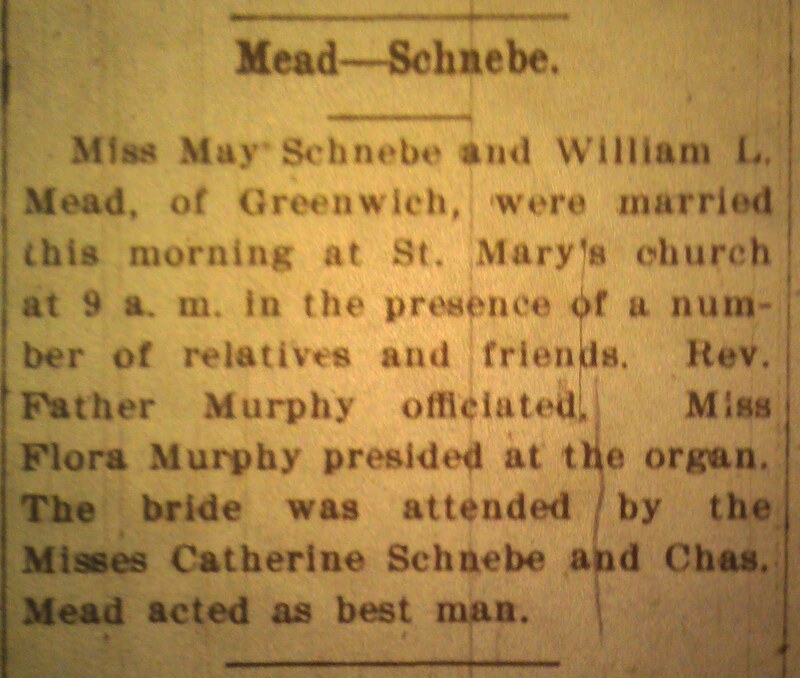 John T. Mead, a brother of the bride, acted as best man. After the ceremony, the bridal party were conveyed by auto to the home of the bride's uncle, where a reception was given for the immediate families and a few relatives and intimate friends. The house was pretty decorated with carnations, roses and palms. 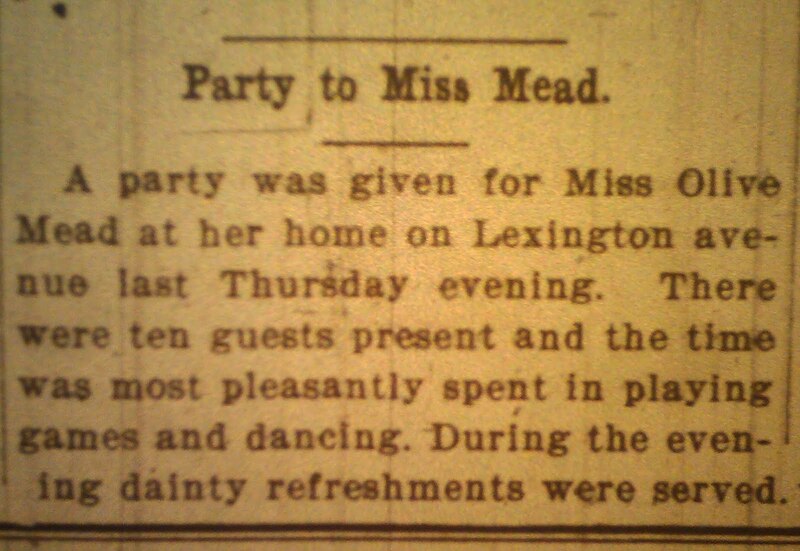 Miss Frances Dorin furnished the music for the occasion. During the evening a wedding supper was served. At a late hour the bride and groom departed on their honeymoon tri, which will be spent in Washington, D.C., and Virginia. 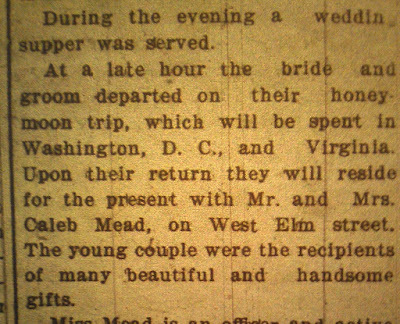 Upon their return they will reside for the present with Mr. and Mrs. Caleb Mead, on West Elm street. 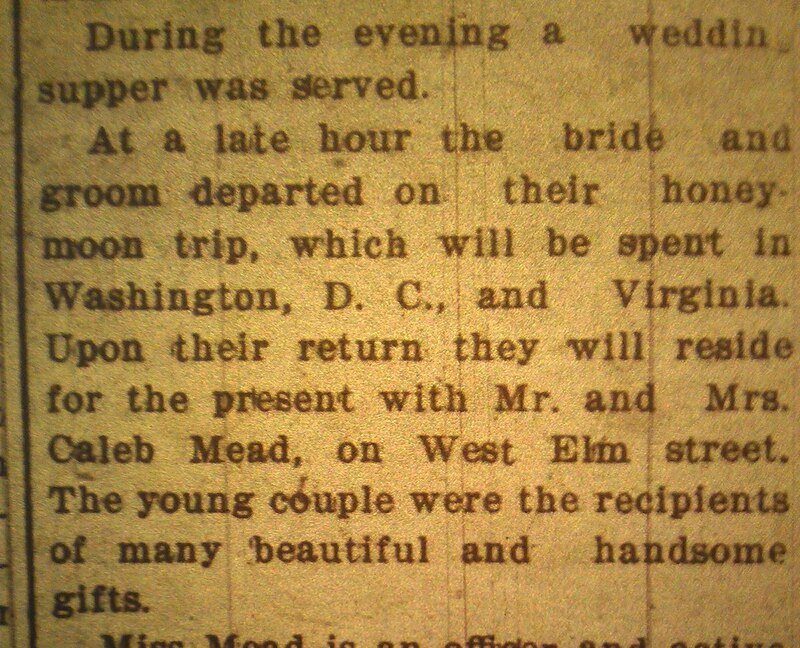 The young couple were the recipients of many beautiful and handsome gifts. Miss Mead is an officer and active worker in Court Saint Francis, Daughters of Castille. She has been employed as bookkeeper n the grocery store of S.A. Moshier for the past four years. Mr. Moshier is one of the rising young men of the community. He has for some time past been connected with his father in the grocery business. He is a member of the Amogerone Fire Company. Source: Greenwich Press. 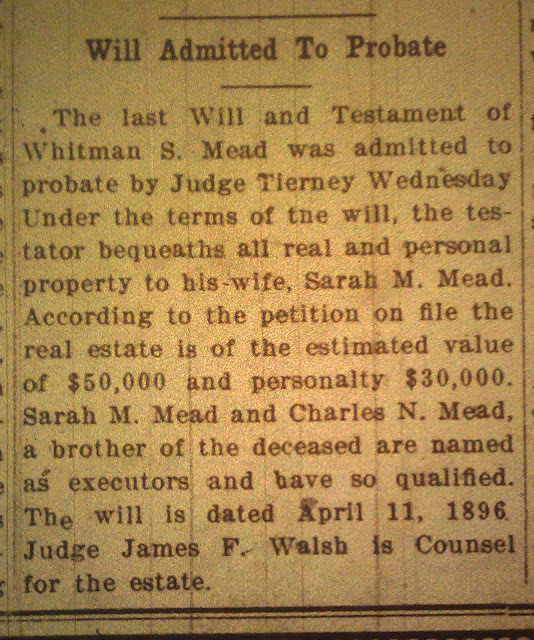 Wednesday, October 1, 1913. Page 4. 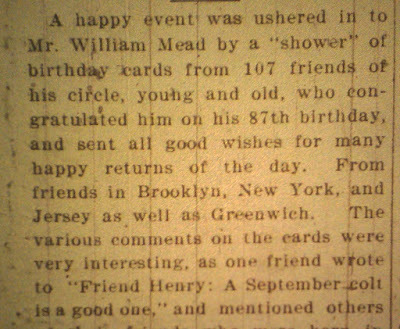 A happy event was ushered in to Mr. William Mead by a "shower" of birthday cards from 107 friends of his circle, young and old, who congratulated him on his 87th birthday, as sent all good wishes for many happy returns of the day. From friends in Brooklyn, New York, and Jersey as well as Greenwich. 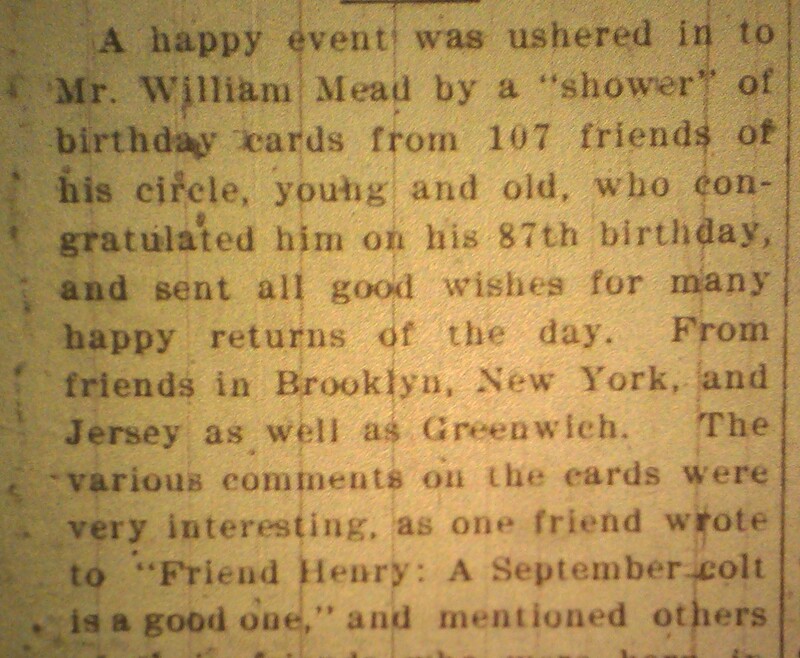 The various comments on the cards were very interesting, as one friend wrote to "Friend Henry: A September colt is a good one," and mentioned others of their friends who were born in September, also telling him to be a good boy and then perhaps he would send him a postal next year. It is not to be wondered that at another friend wrote: "May you keep young for many more happy returns," as it would be difficult to find any one more youthful and vigorous at his age. This thought helps us realize what another friend wrote that "Old age" is but another name for progress on life's highway to the heights. Also what the pastor, the Rev. Mr. Taylor wrote in congratulating Mr. Mead in passing another mile post, and that the next lap be the best of all, the next better still, and so on till the race be won. A very good letter was received from Mr. Woodward of Boston, superintendent of the N.Y. & New Haven road. He had been informed that Mr. Mead was on the first train from Greenwich to New York Christmas morning, 1848, with John Young (who has passed away since) sixty-five years ago. The train went through Harlem. There they took the Harlem train which landed them in Canal Street. 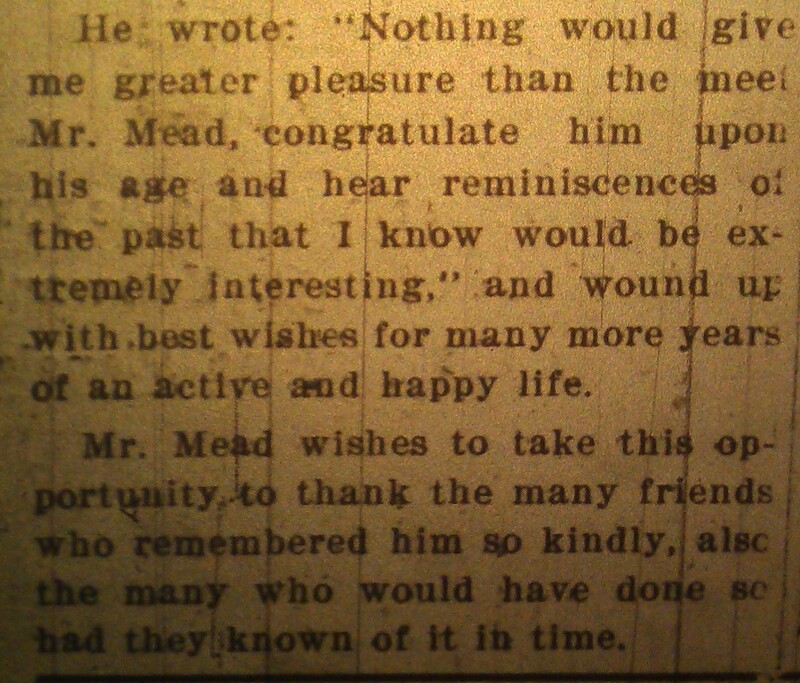 He wrote: "Nothing would give me greater pleasure than the meet Mr. Mead, congratulate him upon his age and hear reminiscences of the past that I know would be extremely interesting," and wound up with best wishes for many more years of an active and happy life. 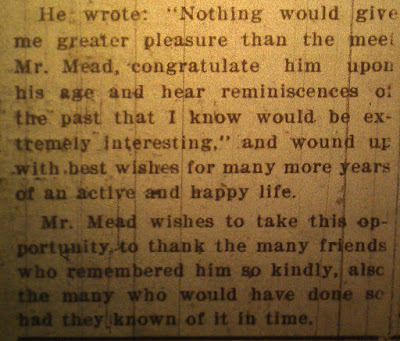 Mr. Mead wishes to take this opportunity to thank the many friends who remembered him so kindly, also the many who would have done so and they known of it in time. 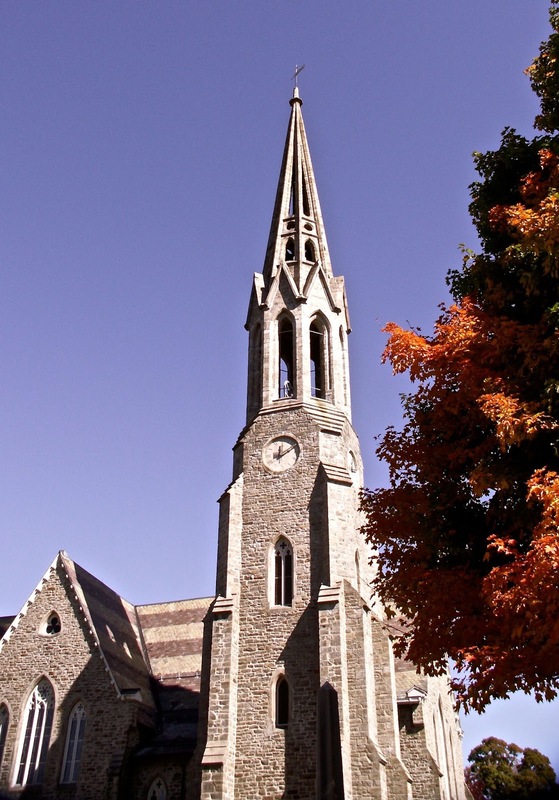 Largely attended by many prominent State Officials and citizens of the town, the funeral service for the late Whitman S. Mead took place from the Second Congregational Church Thursday afternoon at 2:30 o'clock. Judge Jeremiah Tierney, Judge C.D. 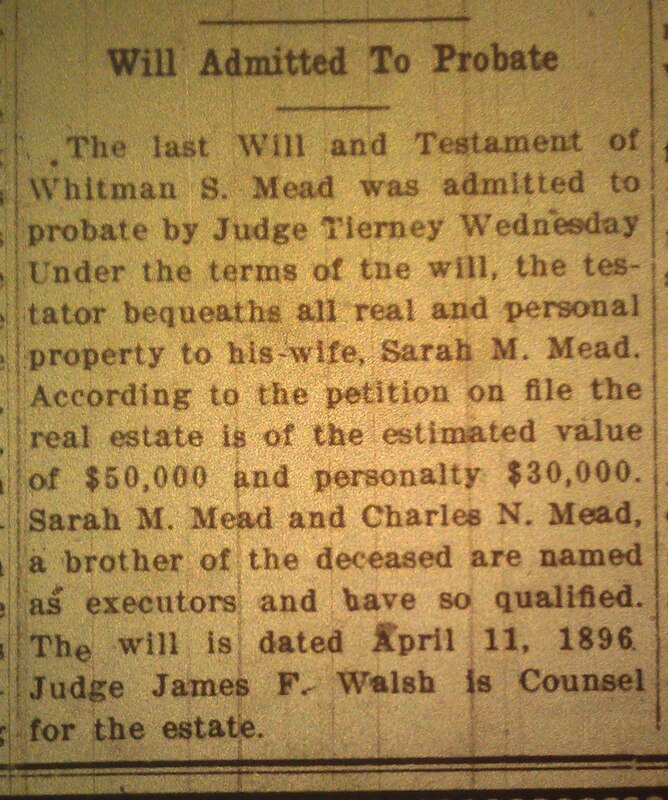 Burnes, Judge R. Jay Walsh, Wilbur S. Wright, Stephen L. Radford, Medical Examiner, John A. Clarke, Warden Henry B. Marshall, Asessors, Will S. Green, Frank I. Palmer, Silas Sutherland, John H. Banks, Patrick Hughes, Gilbert W. Finch, Chauncey Clarke, Hamlin I. Palmer, Sheriff William Vollner, Deputy Sheriff Phillip Finnegan, County Commissioner John J. Brophy and others. Prior to the service the casket was opened and many people viewed the remains for the last time. Miss Laura M. Scranton presided at the organ and Rev. 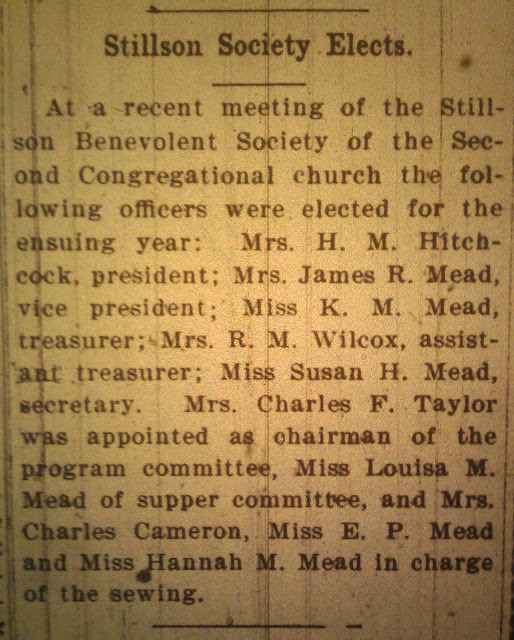 Charles F. Taylor, pastor of the church conducted the service. 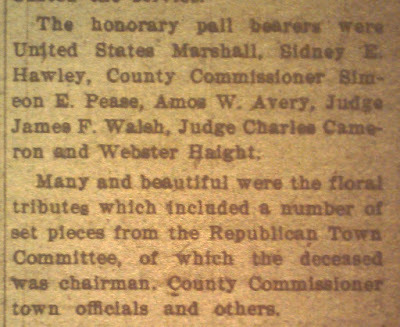 The honorary pall bearers were United States Marshall, Sidney E. Hawley, County Commissioner Simeon E. Pease, Amos W. Avery, Judge James F. Walsh, Judge Charles Cameron and Webster Haight. 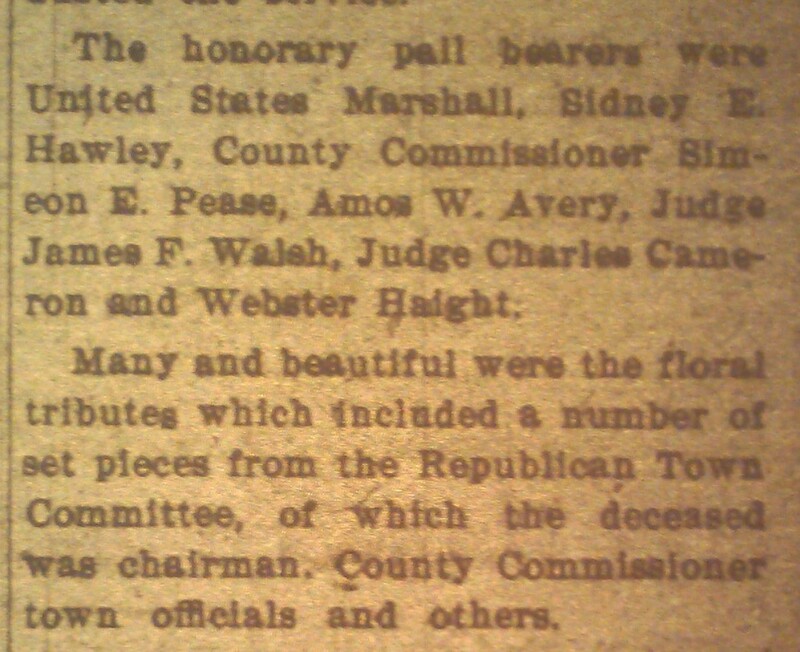 Many and beautiful where the floral tributes which included a number of set pieces from the Republican Town Committee, of which the deceased was chairman, County commissioner town officials and others. During the hour of the funeral all of the town offices were closed with the exception of the Town Clerk's office and the flag was put at half mast on the Town building. 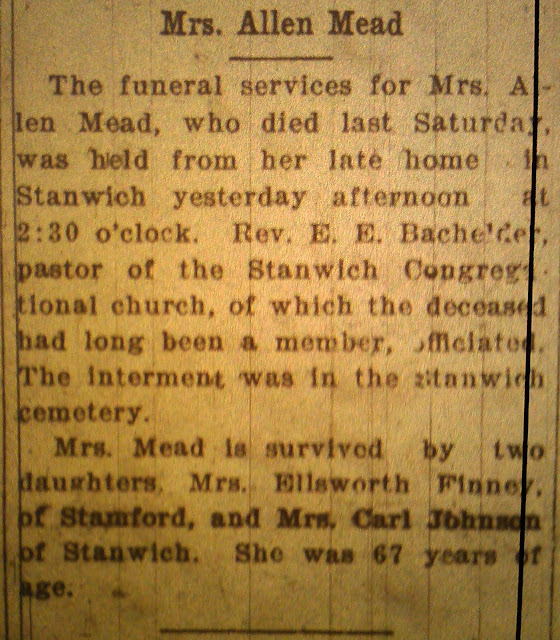 The body was laid to rest in the family plot at the Congregational cemetery. Source: Greenwich Press. 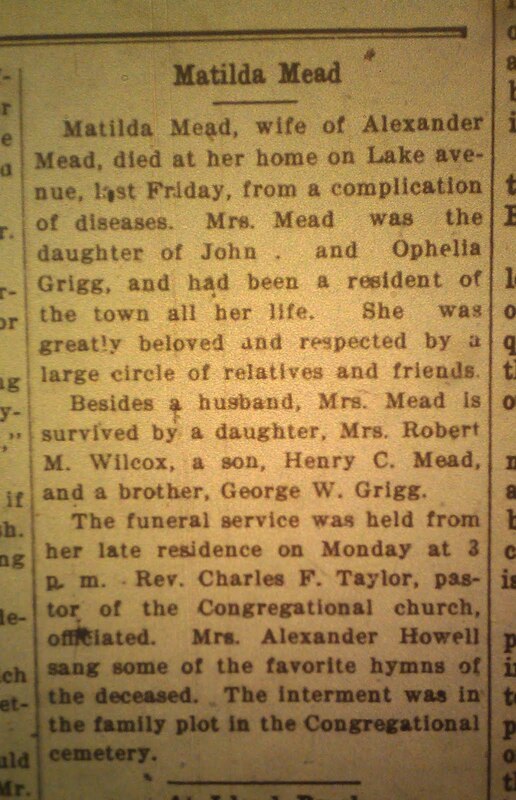 Wednesday, March 4, 1913. Source: Greenwich Press. 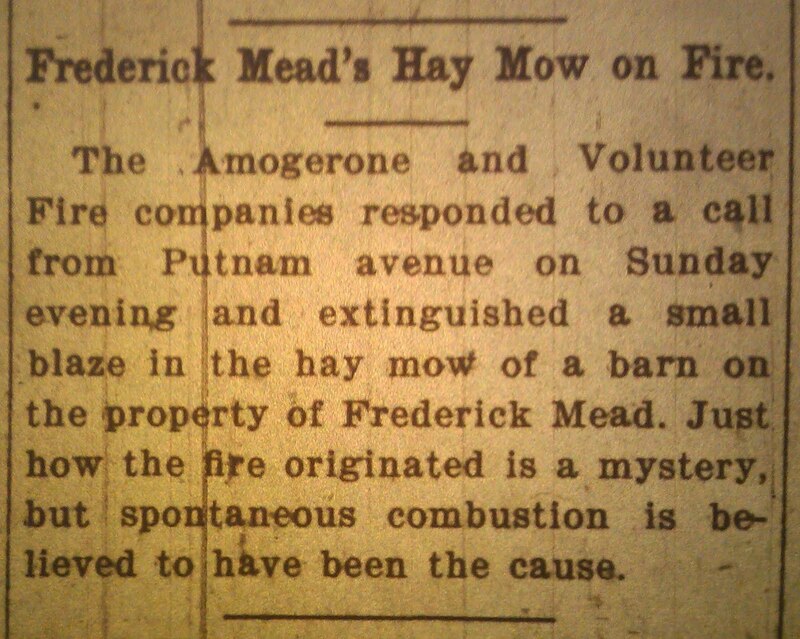 Wednesday, December 3, 1913. Page 12. Source: Greenwich Press. November 23, 1913. Page 2. Source: Greenwich Press. 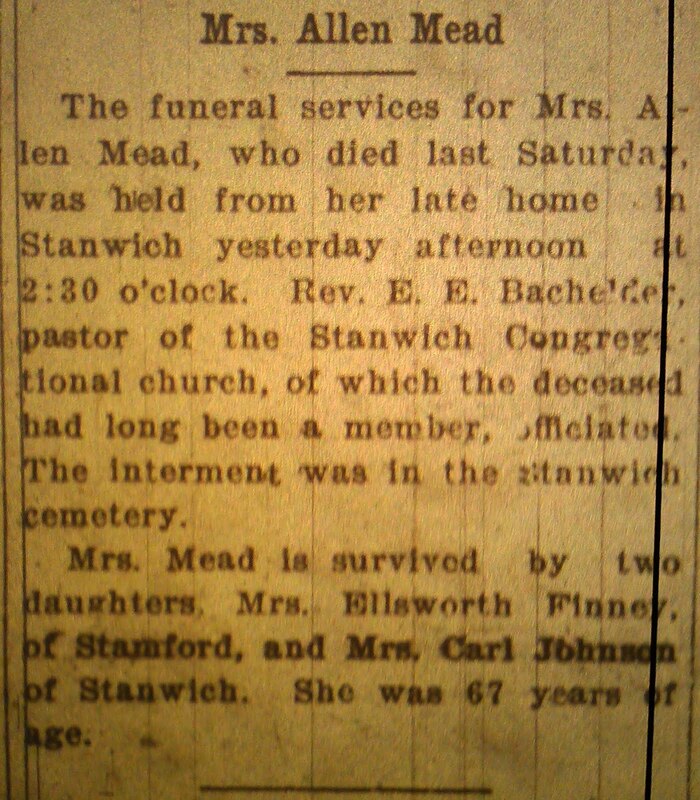 Wednesday, November 12, 1913. Page 2. 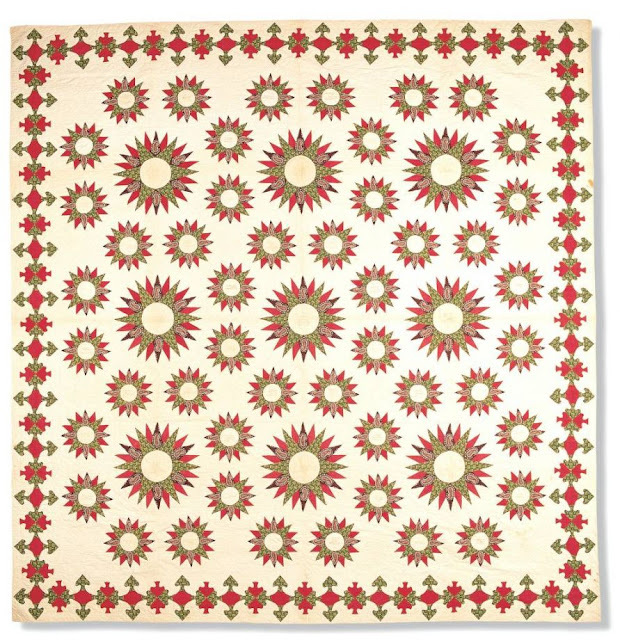 Some of you may have heard about a famous quilt associated with the Stillson Benevolent Society. It dates from circa 1829. 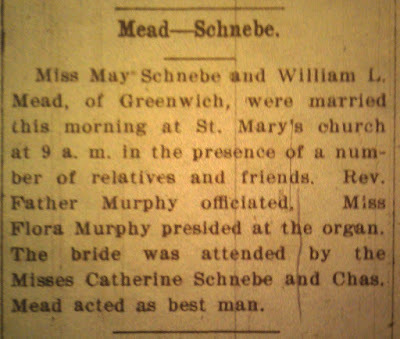 Click this link for a Greenwich Time piece dated April 9, 2010. 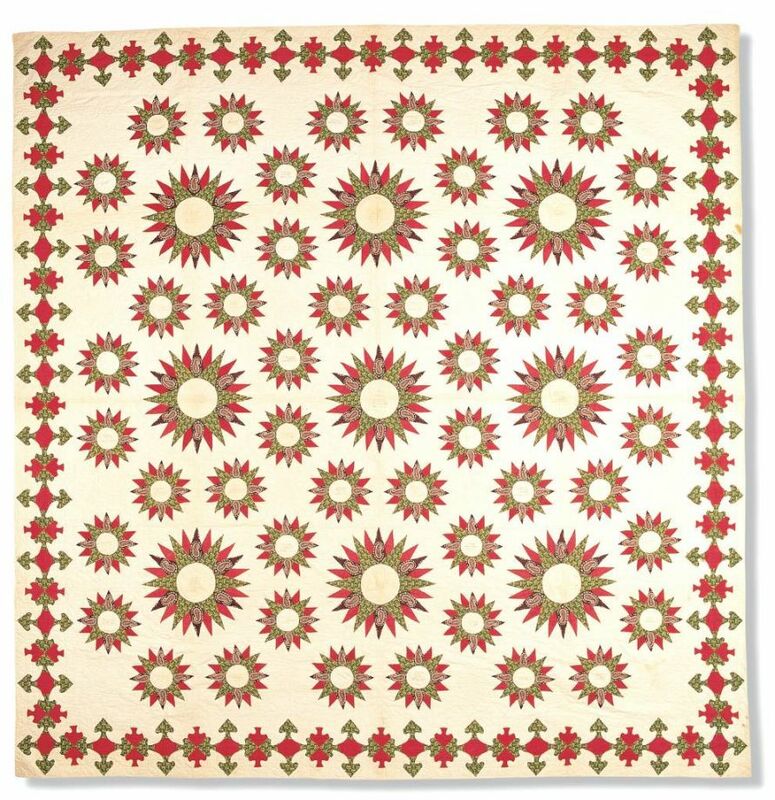 Below is an image of the quilt.